Gas leaks, an odor of gas, damaged lines, and carbon monoxide symptoms are all considered emergencies. If you have an emergency, call our emergency hotline at 1-800-400-4271. Our personnel are ready to assist you 24/7. When in doubt, call us immediately. If you smell gas, do not attempt to locate the leak. Instead, leave the house or building right away. Do not turn on or off any electrical switches, appliances, or lights, as an electrical charge could create a spark. When you are in a safe place, call the Peoples emergency hotline. Peoples e-Account provides all of your account information at your fingertips 24/7. Pay your current bill, start or stop gas service, enter your meter reading, and much more with Peoples e-Account. It’s free, secure, and easy to sign up. Click "Create an Account" to get started today! In the e-Account dropdown option on the homepage, the 'Get the e-Account App' option, you should use the following text: The e-Account app is available for your smart phone! Click the link to download it today from the App Store or Google Play Store. What Is My Pipeline Responsibility? We're a gas distribution company, which means we deliver natural gas to your home or business. In this video, we explain how that process works. We also talk about your pipeline responsibility and how you can protect your pipelines. Our customers are very important to us, and they play a vital role in our day to day work. It is our goal to inform you about what may be happening on your street and answer your questions. Please click on the questions below to learn more about the different steps of our construction process and how those steps might affect you. Many people do not know that they are actually responsible for some sections of natural gas pipelines in and around their home, but it is very important to keep in mind. 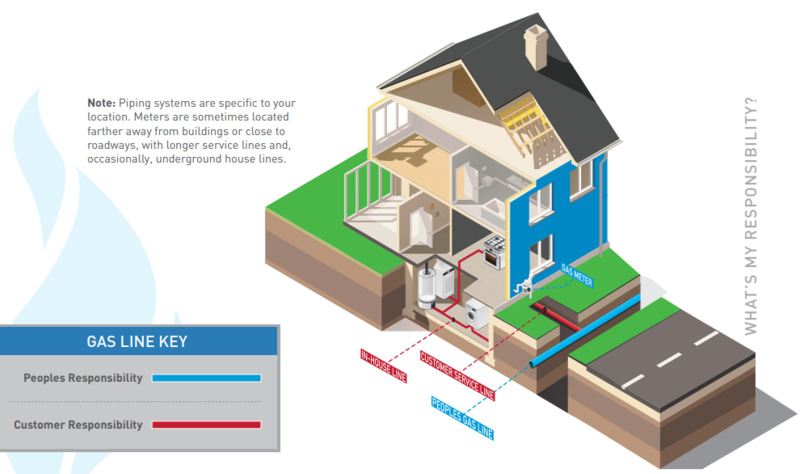 The diagram below shows our pipelines near a home. You can see the labels around different segments of pipe, including which parts are the customer's responsibility, and which sections are Peoples' responsibility. Typically, any natural gas pipeline that runs from the Peoples mainline and into meter is your responsibility as a customer. In addition, you're generally responsible for any pipeline that runs from the meter and into your home, like the pipe that connects to your furnace or natural gas stove. Should there be a need for a service interruption, or if we need to do any pressure testing of your natural gas pipelines, we can schedule an appointment with you in advance at your convenience. At that point, we'll make sure that you understand your customer responsibilities. Whether you speak to a Customer Service Representative, Project Inspector, Project Supervisor, or Project Manager, our employees will be more than willing to help you. "No Parking" signs will be posted in advance in the area of our job sites. Depending on the type of project, the no parking dates will vary in length. Please keep in mind that we will make every attempt to keep this time frame to a minimum. The signs will inform you of the exact dates and times when there will be parking restrictions. Will my gas be off? Depending on the type of work that we are doing near your home or business, there might be a period of time that your gas will be off so that we can complete repairs. We must take this step in order to ensure your safety and the safety of the surrounding community. Before your service is temporarily turned off, Peoples employees will inform you of any interruption that might occur to your service and explain the process to you, including an estimate of how long your gas will be off. NOTE: Once your gas service is turned back on, we will re-light any appliances either at that time or when you request an appointment. We answer these calls 24/7. However, if our employee visits your home and notices that an appliance is unsafe at that time, he or she cannot re-light the appliance. Instead, the appliance will be tagged with a red safety tag. You will have to call a certified plumber to fix the appliance before the appliance can be used again, in order to ensure your safety. When will you be doing work? Although we typically work on projects during standard working hours, please keep in mind that our emergency line repair crews must be available around the clock to respond to an emergency line repair. Even though these situations are rare, we take them very seriously in order to keep our customers and communities safe. These types of projects are on a case-by-case basis, and are not scheduled through our construction department. To speak with one of our Customer Service representatives, give us a call at 1-800-764-0111 from Monday to Friday, 7:00am - 5:00pm. To report an Emergency, please call our 24/7 emergency number at 1-800-400-4271. Keep an eye out for No Parking signs! We will post these signs at our job sites, if needed. The restrictions will be enforced so that our workers can use their equipment and finish up the job efficiently and safely. Find the correct mailing address to pay your bill by mail. Still looking to contact one of our representatives further? Click the link below.